Shifting from only Galleries selling artwork to Artists doing this themselves. This seems simple and cheap! Instead of giving a gallery 40% commission I get to keep 100% of the selling price? Sounds like a win! …but where to market and sell? There is only one answer to this: go to where your buyers are. Most of the people are on social media ALL THE TIME. Facebook has over a billion users, and Instagram is following closely. It has never been so easy to reach potential buyers. So I simply post on social media and am getting tons of buyers? AWESOME! Wait wait wait; it is not thaaaat easy you know. There are a ton of other artists out there doing the same. So you have to have some strategy and plan in place, but this is a matter for another blog post. We are here to talk about websites. Well, you just told me that my buyers are on social media, so why do I even need a website? 1. You don’t own social media. Social media platforms are in constant change. They need to adjust their algorithm and their services to keep up with their competition and with their own business plan. Instagram worked fine when they had only a few million users, but they had to implement an algorithm and change how the platform worked when they grew bigger and bigger. The same happened to Facebook Pages. Also when using other peoples services, you are bound by their rules, and a breach of those rules (even if you have not been aware of you breaking them) can get your account closed, and all your marketing efforts are gone, along with the thousands of followers. You have to begin at zero again. Having your own website vs. only using free social media tools that you don’t own should be YOUR number one reason for investing a little bit of time and $$ on your own site. Now, let’s talk about a few arguments from your customers perspective. When making a purchasing decision, many people look for a website first. Why? 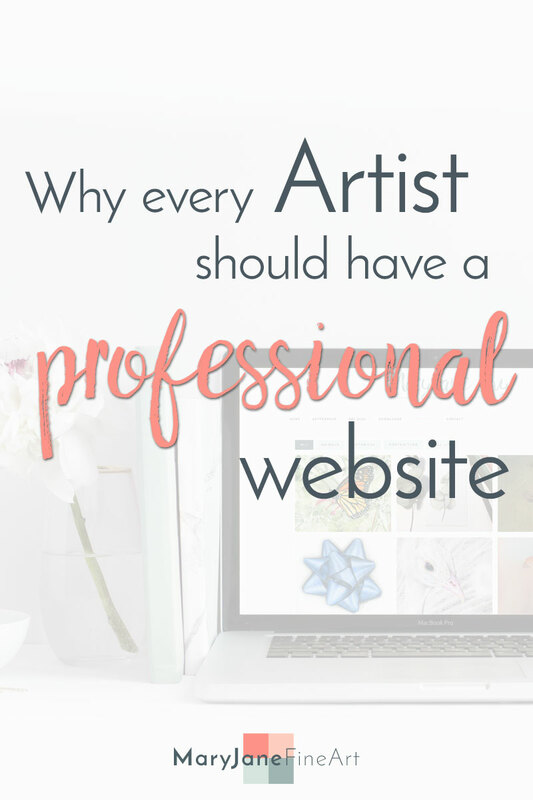 Your artist website puts you apart from a ‘hobbyist’ and in one league with ‘legitimate businesses.’ It gives your visitors a feeling that you have success with what you do since you are already investing back into your business. Moreover, commissioning an allegedly successful artist feels safer than giving my money to just someone. 3. You have a clean portfolio. People don’t have to search through tons of social media posts – many of them, snapshots with lousy lightning, WIP pictures and pics in the ‘ugly-stage.’ Because Instagram and Facebook are like that, you don’t ‘need’ polished images while you would put only your best work into your portfolio on the website. Just imagine you would take a portfolio map to a gallery and put in every littlest progress picture and snapshot in there. This might be of interest to some followers, but it has no place in your portfolio. 4. People can find all the information they need – in one place. They don’t need to scroll through your Facebook Page where you have shared funny stuff, outside links, and that cute kitten video. That is, if you have a Facebook Page for your ARTbusiness, I know many artists who still only use their account – and there a potential buyer has to comb through even more ‘irrelevant’ stuff (irrelevant to making a purchasing decision). It is not always so easy to put a number on how many customers came through your website vs. from social media. Many use the Facebook Messenger instead of using the contact form or an email to contact you. However, their decision to go with you instead of another artist might have been just because of the easily accessible and neatly sorted information on your website. 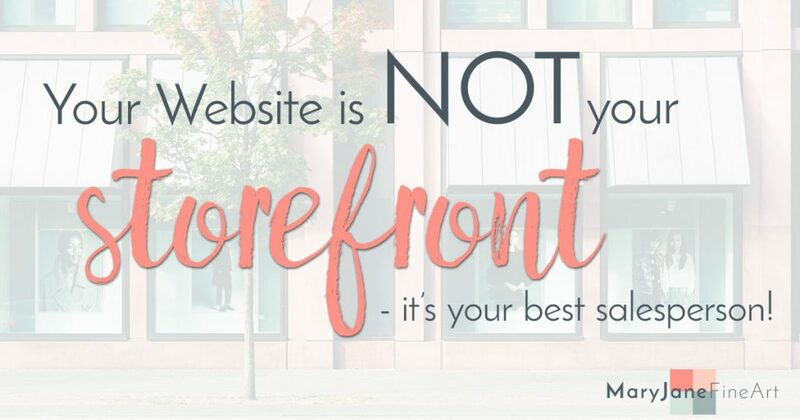 Your Website is the centerpiece of your whole online presence. You use it to create new content and share this content with your social media followers. Instead of writing a long Facebook post you could write a blog post and link it to your Facebook page (just like this post here). If exciting things are happening on your website, people will love to check it out and be there. When your website and your social media accounts play along nicely, you have all eventualities covered. Do you have a website for your ARTbusiness? If not: why not? Let me know in the comments below. Spot in MaryJane. Couldn’t have explain it any better. Thanks for writing and sharing this.